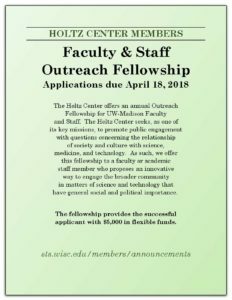 The Holtz Center offers an annual Outreach Fellowship for UW-Madison Faculty and Staff. The Holtz Center seeks, as one of its key missions, to promote public engagement with questions concerning the relationship of society and culture with science, medicine, and technology. As such, we offer this fellowship to a faculty or academic staff member who proposes an innovative way to engage the broader community in matters of science and technology that have general social and political importance. The fellowship provides the successful applicant with $5,000 in flexible funds.